African Blue Basil is a gorgeous rare perennial basil with rich purple flowers. The leaves are also deep purple when young. African Blue Basil grows taller and flowers more profusely than many other basil types and is excellent at attracting pollinators year-round. 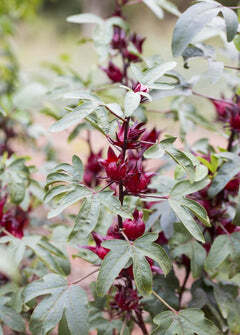 We love to use the fragrant pink and purple flowers in teas and the leaves in stir-fries. Because African Blue Basil is a sterile hybrid of two other unique basil varieties, it does not produce seeds and can only be propagated through cuttings. It is a fast growing plant and when mature makes an excellent hedge. This is a Sow Exotic must have for any permaculture or herb garden. Flowering & Harvest Season: In bloom and ready to harvest year-round.